It’s been a while since we made something in the Instant Pot. Too long. Let’s change that. The Instant Pot (or any electric pressure cooker) simplifies the task of making some of the most basic meal components, in particular: dry beans and stock. Both meal components are usually made in the slow-cooker, which is a time-consuming way to cook anything. I’m certainly not knocking the slow-cooker, but if you want something to be done quickly the slow-cooker definitely isn’t the appliance to make that happen. This is where the Instant Pot really shines. An electric pressure cooker uses pressure to cook food. Thanks to this pressure, food cooks in just a fraction of the time it would take to cook something in the slow-cooker or on the stove-top. Instead of waiting 8-12 hours for the slow cooker to fully cook dry beans (a real food kitchen staple), an electric pressure cooker does the job in under 90 minutes. Homemade stock is another food staple that can take at least 12 hours to fully “render” in the slow-cooker. And I’ll be the first to admit that chicken stock made in the slow-cooker is a treat. There’s a certain depth of flavor that comes from slowly simmering bones for 12 hours. But, most of the time, I need stock to make soup (or another meal) and I don’t have have 12 hours to wait. I need stock instantly! <–See what I did there ;). 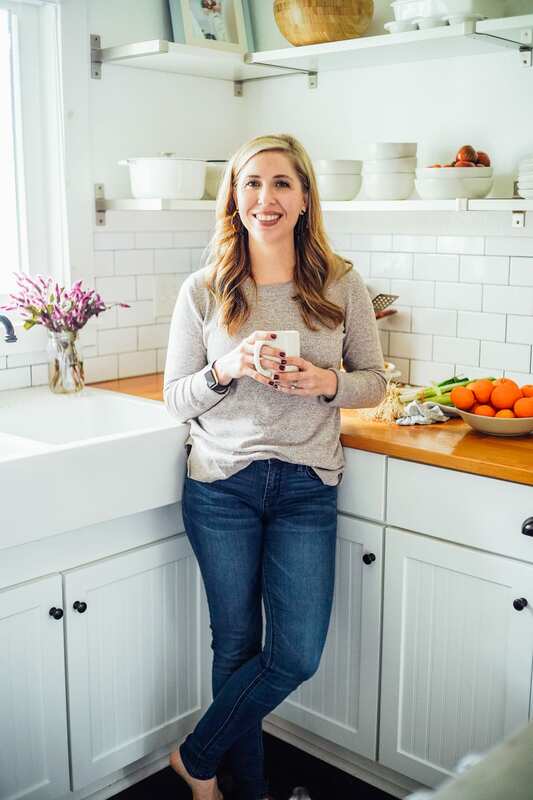 The Instant Pot has become my go-to appliance for making stock when time is in short supply, or when I’m trying to prep on the weekend and want everything to be prepped within a few hours. 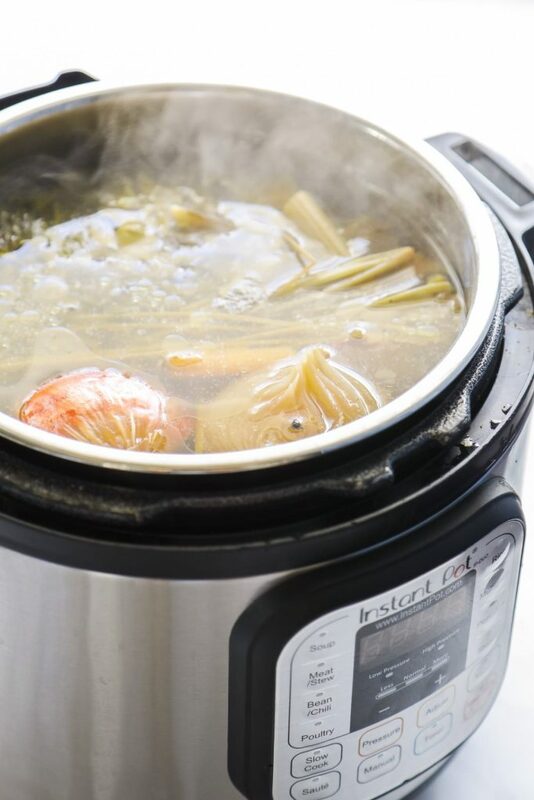 Homemade stock can be made in the Instant Pot in under 120 minutes, from start to finish. Now, I get it. That’s still a lot of time. But it’s nothing compared to 12 hours. And the good thing about making stock in the Instant Pot is most of this time is hands-off time. In fact, all but 2 minutes is hands-off time. 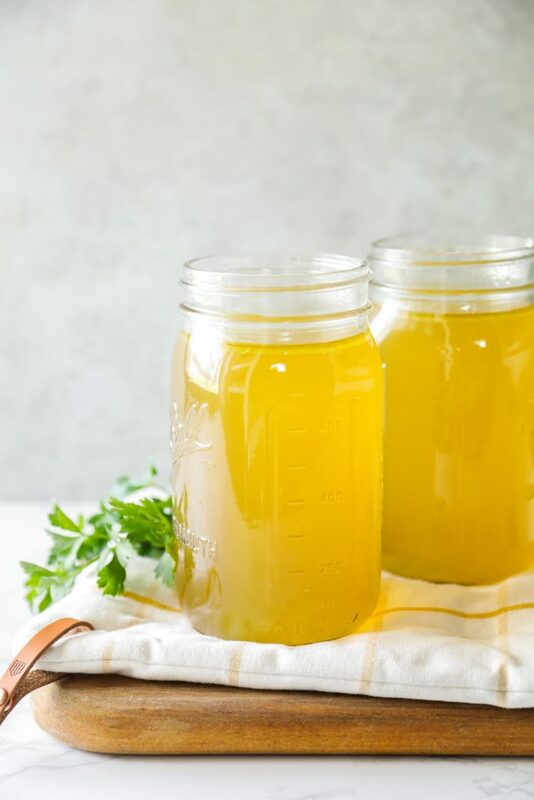 While this post is written specifically for making chicken stock in an electric pressure cooker, you can use this same method for making just about any stock. If you’re going to make beef stock, I recommend roasting or browning the bones (using the saute function on the Instant Pot) before adding the bones to water and veggies. 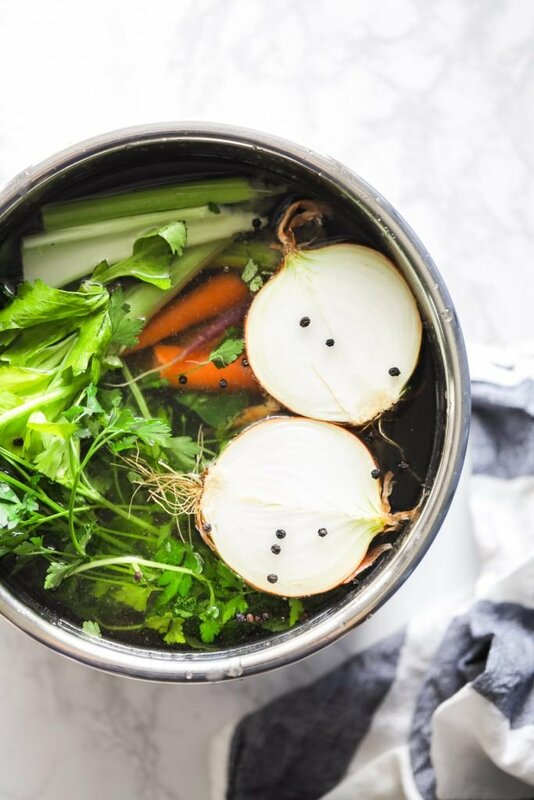 If you’re making veggie broth/stock (which is made by simmering veggies and aromatics in water), you’ll only want to cook the veggies and water for 15 minutes on manual high pressure, then let the Instant Pot naturally release before opening the lid. 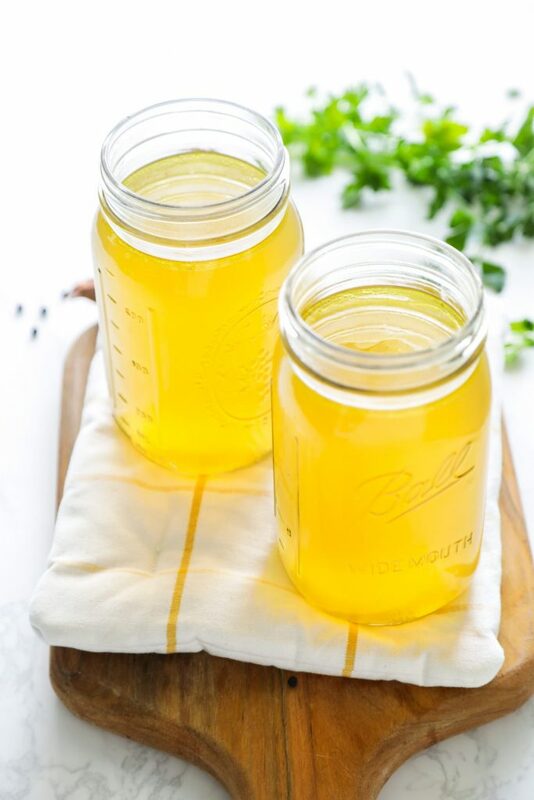 This whole-food chicken stock is simple to make in the Instant Pot, and can be frozen for recipe use months down the road! Place the chicken and veggies (and any additional options desired) in the Instant Pot. Fill the pot with water. The water and veggies shouldn’t come higher than the fill line marked inside the pot liner. Lock the lid and set to Sealing. Set to Manual, High Pressure for 60 minutes. Once the cooking time is up, allow the stock to naturally release (will take about 60 minutes). Or, if you’re short on time, allow the pressure to decrease naturally for 15-20 minutes, and perform a quick release (use a towel or hot pad holder) before opening the lid. Allow the stock to cool to room temperature, or until it's safe to pour into containers. Using a strainer and large bowl, strain the carcass and veggies from the broth. Spoon the stock into storage containers (I use mason jars). Store in the fridge (4-5 days) or freezer (up to 6 months). 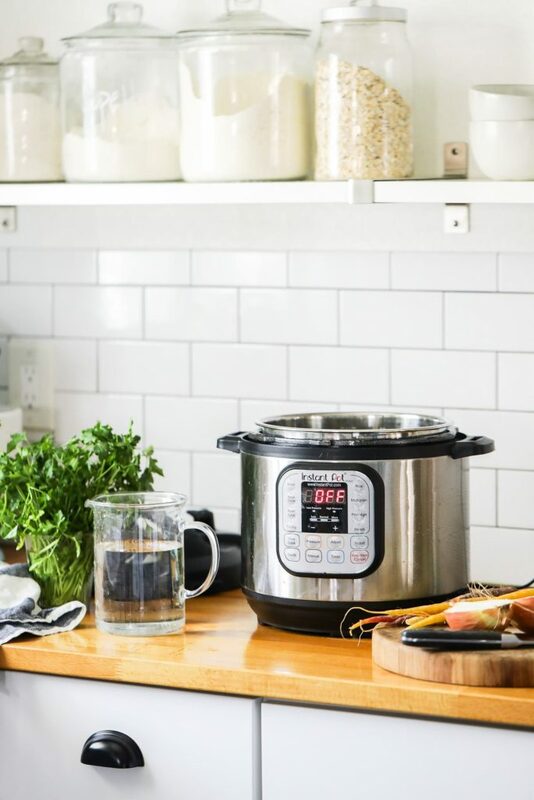 The Instant Pot takes about 25-30 minutes to come to pressure, so factor this into your overall time. You can use warm water and room temperature veggies to help speed this up. The "Additional Options" are a great way to put veggie scraps to use. I like to keep my veggie scraps in a gallon-size bag in the freezer. When I need to make stock, I have veggies ready to go. This is technically considered stock since we're using mainly bones. Either way you refer to this liquid, stock and broth are used the same. Storage Note: If you’re using glass mason jars to store the broth in the freezer, leave at least an inch of space at the top of the jar to allow for liquid expansion. Make sure the stock is room temperature before placing the jar(s) in the freezer. Also, use wide mouth jars. Another option is to freeze the stock in ice cube trays or plastic bags. 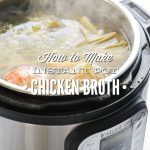 I love how quick and easy it is to make this chicken broth in my instant pot, and it is delicious! Yay, Diana! I’m so glad you’re enjoying the chicken stock! Thank you for sharing.